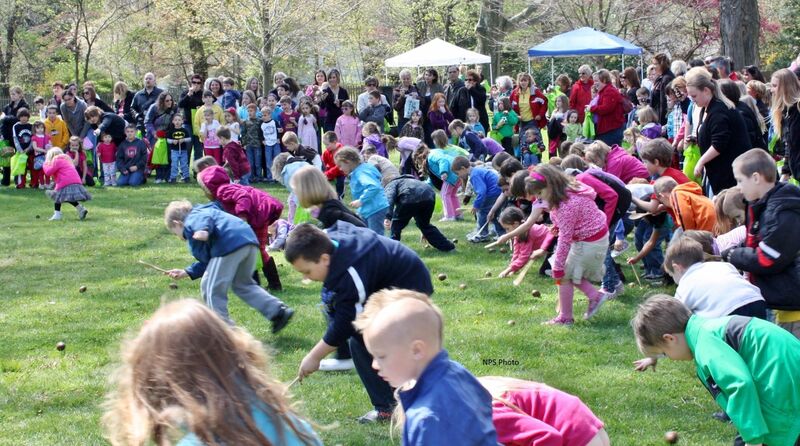 Ohio's Best Egg Hunts for Easter - Ohio. Find It Here. 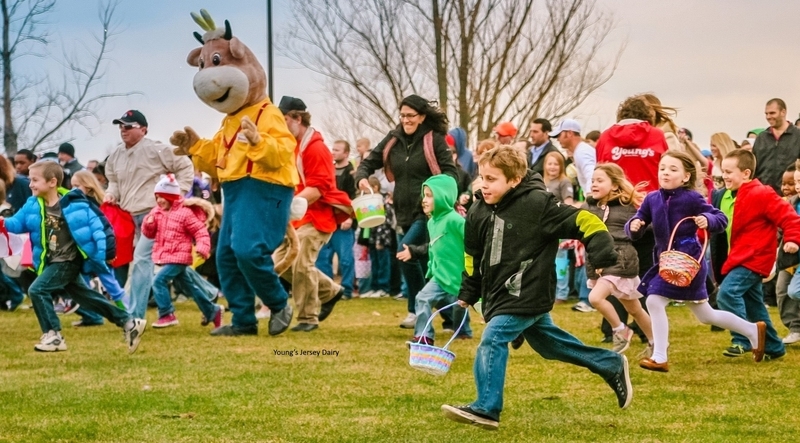 When it’s time to celebrate Easter and go hoppin’ down the bunny trail, no place has more – or more varied – egg hunts than Ohio. From old-fashioned to innovative, here are eight great Easter Egg Hunts that everyone in the family can experience and enjoy. 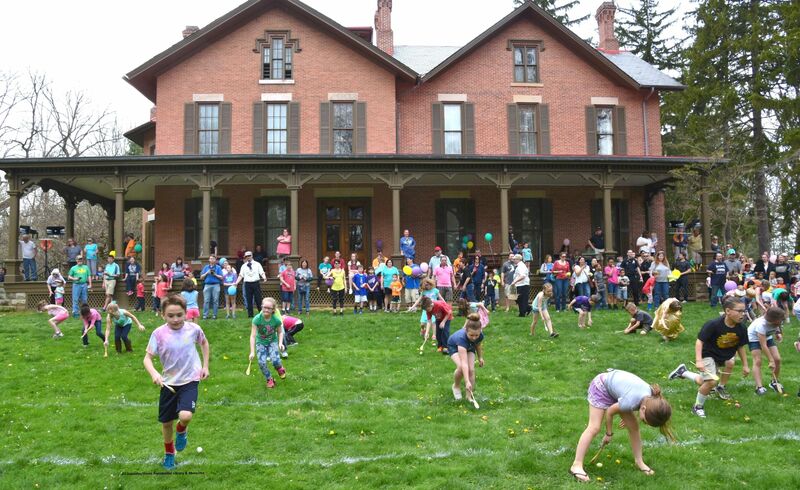 Since President Garfield continued the Easter Egg Roll during his White House tenure, the James A. Garfield National Historic Site in his hometown of Mentor now hosts egg roll races and other children’s games on Easter Monday. First Lady “Lucretia Garfield” welcomes families, and the Easter Bunny and Skipper (mascot of the Lake County Captains baseball team) make appearances too. Bonus: the Garfields’ grand, Victorian-era home is open for tours at this free-admission event. 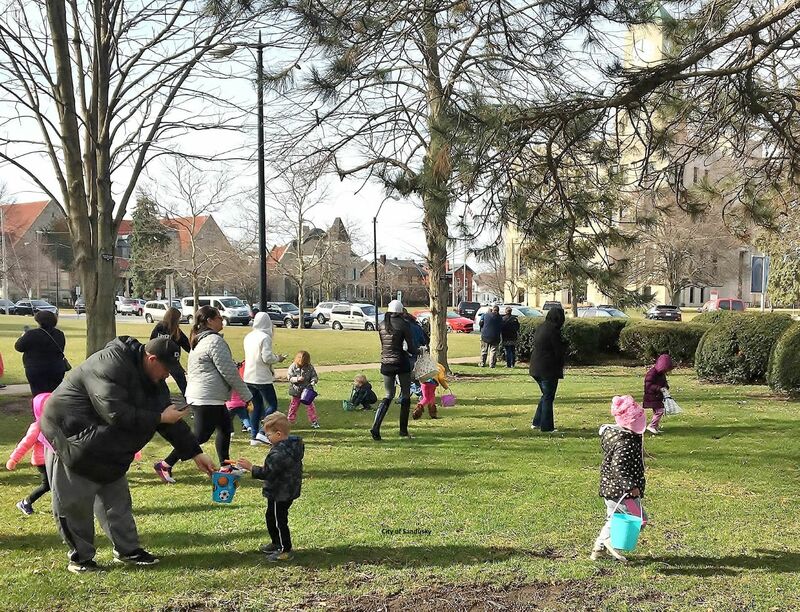 Although Sandusky is an enormously popular Lake Erie port, it also boasts an historic downtown and a splendid central park – Washington Park – where towering trees, spring flowers, and a classic Art Deco courthouse provide a unique backdrop for the city’s annual egg hunt. The event features 3,000 candy-filled eggs and a free showing of the film Peter Rabbit at the Sandusky State Theatre. With animals that range from ducks and swans to camels and llamas, The Farm at Walnut Creek is one of the Ohio Amish Country’s most family-friendly destinations. And with color plastic eggs raining down from a helicopter, its annual Easter Adventure also offers a most imaginative take on egg hunts. Kiddos get prizes for collecting eggs based on their colors, and the whole family can take wagon tours of the farm. Bonus: the array of tasty food for sale includes barbecued chicken, pies, and homemade ice cream. 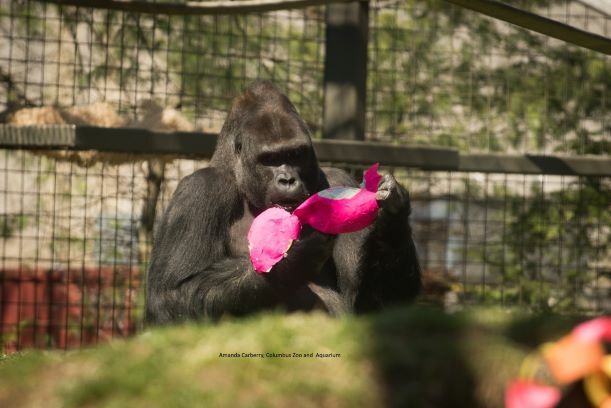 The Columbus Zoo gives a unique twist to conventional egg hunts by letting visitors watch as animals search for colored eggs and other treats. Peter Cottontail also swims with the fish in the giant Discovery Reef tank, and cotton-tailed characters – including Miffy and the Energizer Bunny – populate the Conservation Courtyard. The ancient art of egg decorating is on full display in downtown Steubenville, where business and other venues showcase elaborately embellished three-foot-tall eggs painted by local artists. Folks who follow the trail of gorgeous eggs can vote for their favorite ($1 per vote) at the Eggsibition headquarters in the Steubenville Popcorn Company, and the winning artist get a monetary prize. Tip: the Steubenville Popcorn Company’s seasonal Bunny Bait popcorn is delish. 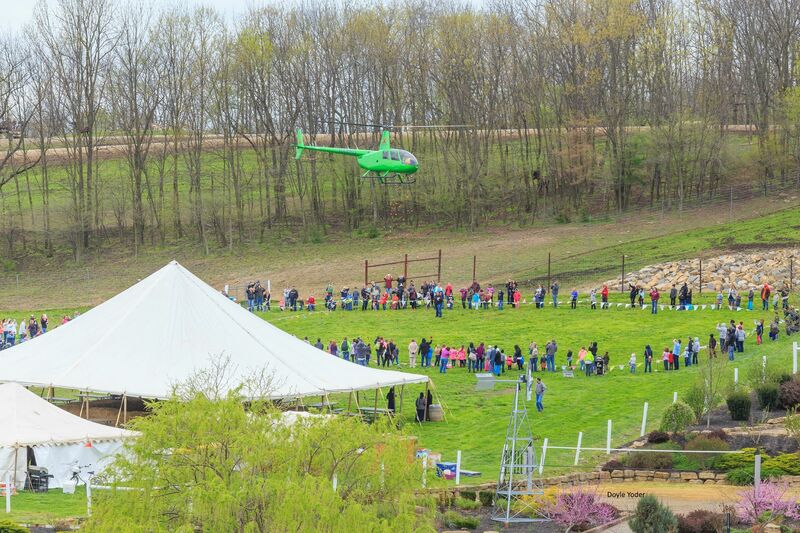 An enormously popular agritourism destination, Young’s Jersey Dairy lives up to its slogan, “#1 For Family Fun,” and what could be more fun on Easter Sunday afternoon than turning the kids loose to look for more than 8,000 real eggs that have been hardboiled and dyed? Since Young’s is a working dairy farm, Barnabe, its jersey cow mascot, always joins in the hunt, and afterwards, everyone loves to eat Young’s moooooovelous homemade ice cream. 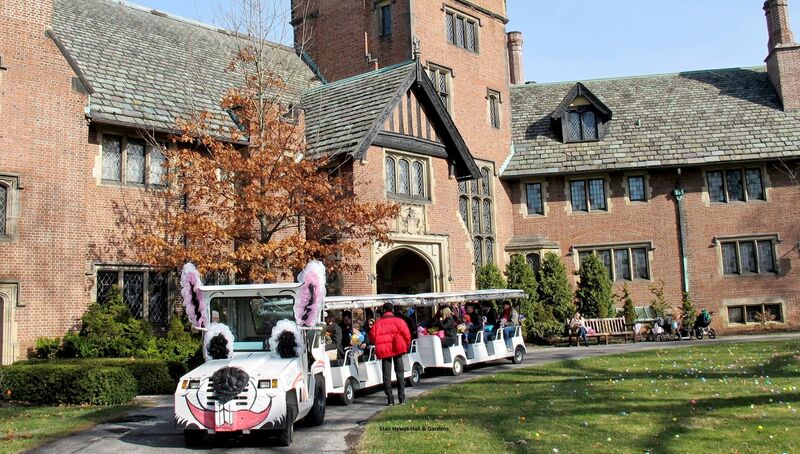 Breakfast with the Easter Bunny includes a ticket to ride on the Eggspress for a tour of the beautiful grounds of Stan Hywet, the phenomenal former home of Goodyear Tire & Rubber co-founder F.A. Seiberling and his wife Gertrude. Mother Goose conducts story time at breakfast; Little Bo Peep, Little Miss Muffet, and Little Red Riding Hood distribute treats; and petting live lambs and ducks is ideal for photo ops. Tip: this event usually sells out quickly. Admission fee. For more seasonal activities and fun, Find It Here. at Ohio.org.